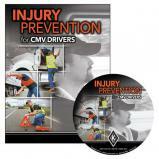 Reduce the risk of driver and dock worker injury with this specialized training. 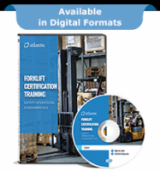 Includes Loading Dock & Warehouse Safety and Material Handling Equipment Safety programs. This course will cover the basic features and safe operating guidelines for portable loading ramps. Loading & Unloading training is designed to help truck drivers understand the basic techniques that will help keep them safe while loading or unloading their straight truck. The ultimate in warehouse safety training these 26 DVDs cover subjects that apply to virtually all general industry workplace environments. Get your material-handling workforce up-to-speed on important OSHA regulations and recognized best practices. 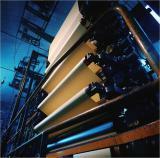 This program outlines and explains the hazards of forklift operation. It details the reasons why forklifts can become unstable and tip over. It examines ramp and loading dock accidents as well as hazards that pose a threat to the safety of pedestrians. Forklifts and other powered industrial trucks are indispensable in many companies. They are rugged powerful tools that save time, money and effort. But the same qualities that make them so helpful can also make them dangerous. Using powered industrial trucks results in over 100 fatalities and over 35,000 serious injuries each year. When used incorrectly, or if forklifts and other trucks are not properly maintained, they can do significant damage. This program is designed to help drivers avoid preventable injuries while on the job by recognizing and avoiding risks and adopting safe work practices. 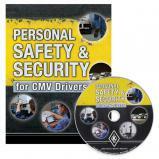 Personal safety and security training that teaches CMV drivers how to protect themselves from the threat of theft and physical violence when they're on the road. Powered pallet jacks can be found in almost any warehouse, manufacturing facility or loading dock. They’re real work-horses that are simple to operate – but can cause serious damage or injury if not used correctly. Special Driving Conditions - Regardless of the nature of the hazardous road or weather conditions we may encounter, the key to remember is that if we know what waits for us down the road, we can adjust our driving and our schedules to allow us to do our jobs safely. Knowledge is always our best defense. So how do we get the information we need to stay on top of changing conditions? Let�s look at some of the things we can do. First of all, anyone operating this equipment must be trained and authorized by the company. Your license means you have received training and are capable of safely operating this equipment. 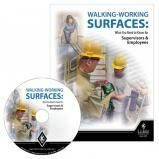 Designed to help employees and their supervisors understand the OSHA Walking-Working Surfaces rule and their responsibilities under the new slips, trips and falls requirements. English & Spanish available all in one program.